Crystal Springs Motel - Radium Hot Springs, B.C. Crystal Springs Motel, located in the centre of Radium Hot Springs. Uncompromising cleanliness and friendly service is their speciality. Your Columbia Valley adventure starts at the Crystal Springs Motel. Located in the center of Radium Hot Springs, on a quiet side street, close to all community amenities. All units at the Crystal Springs Motel offers air-conditioning and wireless internet access. The Crystal Springs Motel has a wide range of rooms and kitchenettes to meet your vacation needs, the rooms are 100% NON-SMOKING and registered guests of the Crystal Springs Motel are offered a complimentary Hot Breakfast, however some restrictions may apply. For vacationers travelling with their beloved pets, the Crystal Springs Motel is pet friendly and is ideal for those traveling with on motorcycle. The Crystal Springs Motel has a selection of family and executive style rooms for your stay. The Crystal Springs is a two story facility with outside entrances that face onto our patio and grass area, the property is predominately non-smoking. While they are pet friendly, the Crystal Springs Motel has rooms that are pet free for those with allergy concerns. The Crystal Springs Motel has a beautiful outdoor living space, BBQ area, and the Village playground only one block away for your family to enjoy. Nearby amenities include, the Radium Hot Springs, Valley Zipline Adventures, Kootenay River Runners, Springs and Radium Golf Courses, as well as hiking and biking trails and fabulous dining. The Crystal Springs family is always available to make your stay as enjoyable as possible, let them assist you in choosing great dining options and planning activities from everything our amazing valley has to offer. 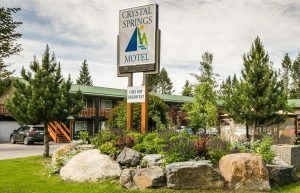 Whether you are visiting Radium Hot Springs for a vacation or a weekend retreat, they know that you will love your stay at the Crystal Springs Motel.